The famed Hellboy director wants to put most of DC's supernatural roster in a single movie. Ever since Marvel Studios turned The Avengers into a Hollywood blockbuster, comic fans and film critics alike wondered how DC would respond. A Justice League movie is practically guaranteed, but more will be needed if Warner Bros. wants its own cinematic comic-book universe. DC's catalog has no shortage of characters and stories to draw from, but how can Warner Bros. produce superhero movies that stand apart? Guillermo del Toro has one suggestion that steps outside of the traditional superhero model altogether. The Hellboy director wants to produce Dark Universe, a movie that would bring magic-based characters like Deadman, John Constantine, and the Spectre into a single supernatural story. "I'm writing the outline and we're already in talks with a writer," del Toro confirmed in an interview with IGN. "A very, very good writer. I think people are going to be happy with who we have chosen. And he accepted." Dark Universe bears some resemblance to Justice League Dark, a comic book that pits DC's supernatural heroes against magical threats that the regular League can't handle. The characters Dark depicts were a major part of DC's Vertigo line in the 80s, and served as an inspiration to a young del Toro. "You're talking about my childhood," he jokes. "Swamp Thing, for me, is a rock star ... the Jack Kirby Demon Etrigran is amazing. And then you go to Constantine, who I thought was an amazing creation... [Dark Universe is] really really a lot of work, but a lot of fun." Del Toro is keeping Dark Universe's plot a secret, but confirmed that Deadman, Zatanna Zatara, and the Spectre all have a place in the story. Del Toro also emphasized a desire to closely follow the comic book versions of the characters, as opposed to certain backstory-altering film adaptations we could name. 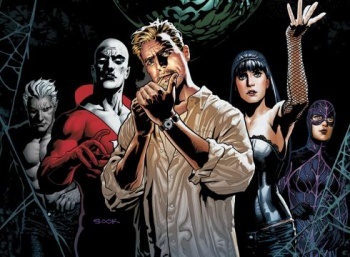 Producing such a niche project ten years ago would have been an impossibility, but in light of The Avengers and Justice League Dark's successes, Dark Universe may actually have a chance of coming to the big screen.